Too much information? Or not enough? A couple of photos from an afternoon stroll around Bangor recently. Do we really want to know anything more? It's been a wonderful couple of months for the Blues in Maine (as you can tell by some of my previous posts about gigs we've managed to catch). 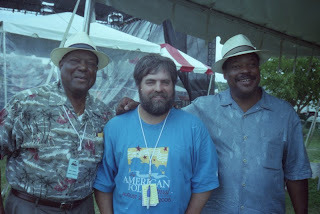 It's also been a sad week as a couple of excellent Bluesmen (see previous post about John Cephas) have passed on. These photos of Willie King and the Liberators were taken at the 2006 National Folk Festival in Richmond, Virginia. Submitted to Unique's photo challenge for Path. Dare you venture further...? Science may be happening! Submitted to Shutterday's Science challenge. I read about the passing of John Cephas just a few minutes ago. I was fortunate enough to have gotten to know him (and Phil Wiggins) when they appeared at The American Folk Festival on the Bangor Waterfront in 2005 and to have been able to cross paths with them a few times since then. Thanks for the music, John. Rest in Peace. Photos above from the National Folk Festival in Richmond, Virginia in October, 2007. 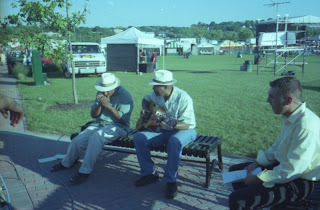 Photos below from the American Folk Festival on the Bangor Waterfront in August, 2005. I've been wanting to see Chris Duarte perform since hearing his first album "Texas Sugar / Strat Magik" back in 1994. He's played in Maine a few times (I heard great things about his shows at Raoul's in Portland in the '90s! ), but I have managed to miss his shows - until now. After being delayed by a day (snow storm on Monday's scheduled date) Chris came and rocked the Time Out Pub in Rockland on Tuesday. Guest Photographer Jenny Why_Me took the above photos. I especially like how Willie Nelson's visage on the t-shirt seems to be singing along. The photos below are my shots.